The Monday afternoon sunlight fills the Brookhaven College hallway as Cindy Castaneda walks to class on the first day of the fall 2014 semester. Wearing black Anne Klein pumps and carrying a purple backpack, she takes a deep breath as she enters the introduction to geographic information systems classroom. Cindy Casteneda teaches her Texas government class. Photo by Andrew Gonzales. It’s her first day of school all over again, and she is flush with uneasiness. A flood of doubts fills her mind. The answer, she soon realized, was no. At the age of 44, it would just take her a little longer than her classmates. She would not be skilled in the subject at first, but she would work hard. She was willing to do it over and over and over until it was good enough. That work ethic was fostered by Castaneda’s parents, who told her and her sisters they could do whatever they wanted in their lives. But whatever they did, they had to do it well. Castaneda grew up in the border city of Calexico, California, with her mother, Xochitl Garcia, her stepfather, Adolfo Ponce, and her three sisters, Wendy Castaneda, Liliana Ponce and Susana Ponce. With a population of about 36,000, the city sits in a valley of sand dunes surrounded by agricultural farms that provide the main source of labor. Castaneda’s stepfather worked in the fields from sun-up to sundown cultivating produce. Adolfo would come home tired, drenched in sweat, and he would often bring home vegetables from the farms. The family struggled to make ends meet. For a while, Ponce couldn’t find work because he was blacklisted for supporting labor leader and civil rights activist Cesar Chavez and the United Farm Workers strikes. Garcia would often take Castaneda to a dumpster behind the local K-Mart to search for usable items. Employees would throw out books, clothes and other items that they weren’t able to sell after re-stocking. Because she was so small, Castaneda would be the one to crawl through the dumpster. “What’s in there?” her mom would ask from the outside. “OK, throw those out!” her mother would say. They would walk home with arms filled with treasures, and Castaneda would use the books to make up for the lack of a nearby library. The books Castaneda would find sparked a lifelong love for education and continuous personal growth. Castaneda’s eagerness was paired with her parents’ commitment to keeping the family name associated with hard-working people. Castaneda used it to achieve her goals in education. She strived to excel in the classroom. Instead of attending her local high school, she won a scholarship to attend a nearby boarding school known for college preparation. She won another scholarship and was accepted into Harvard University. 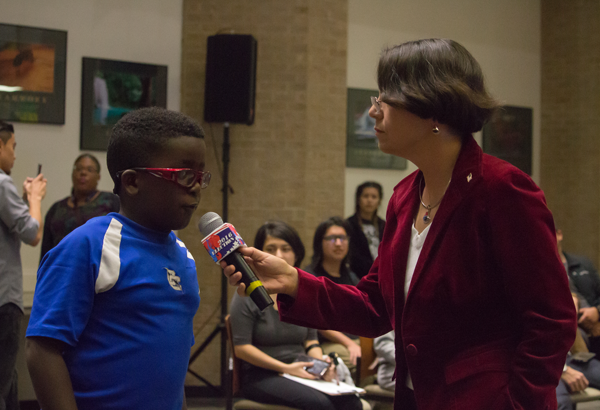 Cindy Casteneda speaks at the Eastfield election watch party on Nov. 8, 2016. Photo by Ahmad Ashor. International students from all around the world walked the Harvard campus with Castaneda when she arrived in Cambridge, Massachusetts in 1984. The small boarding school she had attended was nothing compared to the 210 acres and large buildings. She now had two roommates, one from New York who was born in China and another from Nova Scotia, Canada. But she was the one who felt out of place. “Even though I was on par with the rest of the student body academically, I was still excluded in some ways socially because I was a first-generation student,” she said. It felt like Harvard was more exclusionary to students like her and had more disadvantages for first-generation and low-income students. Students from wealthier and more educated families had more connections and advantages within the university. There were clubs that some students couldn’t join due to the high cost of entry or lack of family history at the university. Castaneda was also struck by how disconnected the Harvard professors were from their students. While her high school classes had about 12 students each, her English class at Harvard consisted of 800 students packed in a theater. Castaneda sat among a large mass of students, watching the tiny professor teach below with graduate students beside them, the latter often answering questions or even lecturing themselves. It puzzled Castaneda to see so many students pay so much to attend such a large class when she paid the same amount in high school for a class of 10 students. Castaneda was also encouraged to direct questions to the graduate assistants instead of interacting with her busy professors. When Castaneda encountered material she didn’t understand, she would often walk by her professor’s office, but she never asked for help. 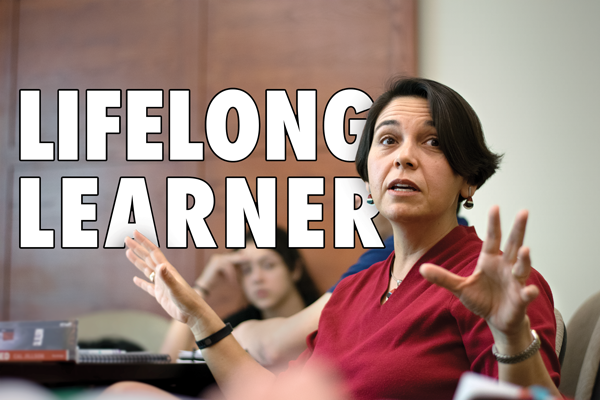 When she became a professor, Castaneda wanted to be a different instructor. She wanted to give her students a better experience than the one she had with her own professors. After earning a bachelor’s degree in social studies with honors from Harvard and her master’s in public policy from the University of Chicago, Castaneda decided to become a teacher and college administrator. Being a teacher wasn’t her first choice until she had the opportunity to work as one. She avoided community colleges and wanted to work at a prestigious school. While pursuing her doctorate in higher education at the University of North Texas, she took an introduction to the history of community colleges course. By the end of the semester, Castaneda realized that community colleges offered more than she expected. She realized that the experience that she had at Harvard wasn’t what she wanted to give to students in the future. She wanted to teach them face-to-face as her high school teachers did. She could work with first-generation students, with students of color, with students who hadn’t discovered their potential. Cindy Casteneda interviews people at the Nov. 8 2016 election night watch party. Photo by Jasmin Jimenez. She could use education as an agent of change in their lives just like education was for her. Castaneda started her teaching career at Eastfield in 2003, then moved to Richland College in 2004. 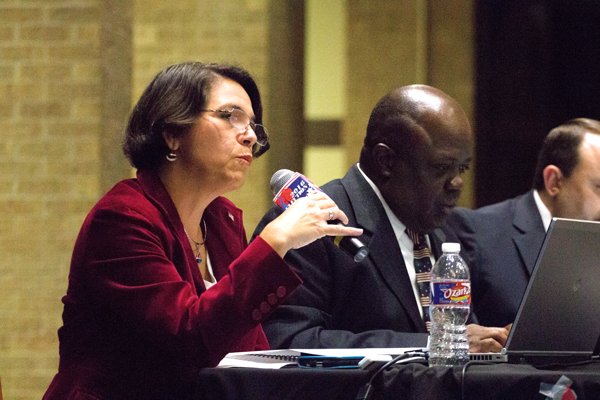 In 2008, Castaneda ran for a seat on the Garland school board and served until 2015. She was the executive dean of ethnic studies and a social science professor at Richland College before returning to Eastfield in 2010 to teach government. Being a faculty member gave her the flexibility to spend more time with her children. “My goal for many, many years was to be a college president, but I don’t think that anymore,” she said. Instead, she wants to continue teaching. While teaching, she strives to use what she’s learned as a student to elevate her students inside and outside the classroom. Castaneda returned to school to pursue an Associate of Applied Science purely out of academic curiosity. An avid traveler, she wants to learn more about management and analysis of digital interactive maps and data. As a wife, mother of two and a full-time government professor at Eastfield, Castaneda has her plate full. She doesn’t let this stop her and is always looking for a new challenge. 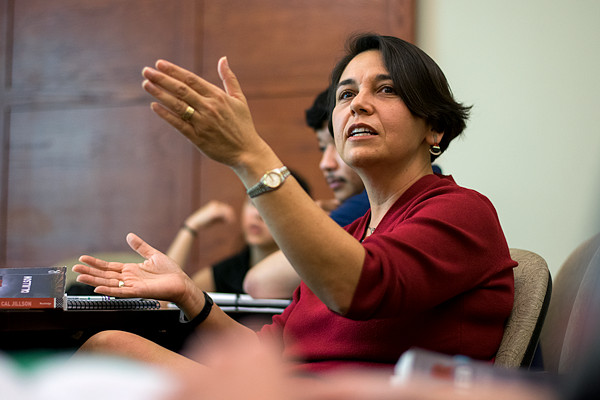 In order to fulfill a speech requirement for the associate degree, Castaneda took Fundamentals of Public Speaking with fellow professor Courtney Brazile, creating a unique situation between the two. Brazile saw first-hand the passion for learning that Castaneda possesses. In her government classes, she makes it mandatory for students to meet her for at least an hour once a semester. In this hour, the students can discuss their class struggles and their plans for the future. 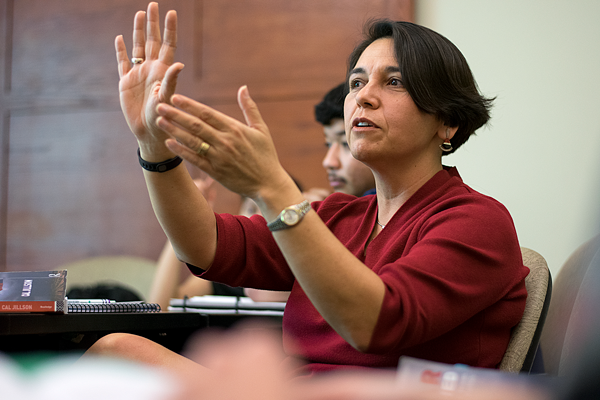 Professor Cindy Casteneda teaches her Texas government class. Photo by Andrew Gonzales. Students routinely visit Castaneda’s office after their government class. There are two desks in her office, and the blinds on the far wall are open, bringing in sunlight. At the base of the window is a rectangular pot with various small cacti and succulents. The walls are filled with paintings, prints, framed certificates, awards and diplomas. A colorful stone sign hangs on the far wall with a message in Spanish translating to “Here lives a professor.” On another wall are two colorful paintings of traditional Latin American and Hispanic art pieces. One features two women gossiping while working in an agricultural field, and the other shows workers in a watermelon field. The artwork serves as a reminder of her childhood, particularly her stepfather. Photos of her husband, children and friends adorn her desk and windowsill. She turns her chair to face her students with afternoon light entering from the window. Science major Karleigh Vestal hasn’t had the best experiences with the college’s advisers. Her meeting with Castaneda was different. “She cares about everybody, not just [the students] in class for her,” Vestal said. In December, after two-and-a-half years of work, Castaneda received an Associate of Applied Science in Geographic Information Systems from Brookhaven College. She doesn’t plan to fully enter the GIS field, but she plans to incorporate it into her classes. It will be her fourth and final diploma, she announces.